Most indications suggest that the Jacksonville Jaguars won’t be using the third overall pick next week in the NFL draft on a quarterback. Then again, their interest in South Carolina defensive end Jadeveon Clowney, Clemson wide receiver Sammy Watkins or Buffalo linebacker Khalil Mack might be just a smoke screen for a team coveting UCF’s Blake Bortles, Texas A&M’s Johnny Manziel or Louisville’s Teddy Bridgewater, whose apparently plunging stock could not have been foreseen when March began. Fans who have stuck with the franchise — which has made the playoffs only twice since 1999 — don’t need to be reminded that drafting a quarterback with a top 10 pick is no guarantee of positive results. Blaine Gabbert and, to a lesser extent, Byron Leftwich should serve as cautionary tales as general manager Dave Caldwell, coach Gus Bradley and others involved in the Jaguars’ selection process ponder a position where only Chad Henne has any experience of which to speak. But over the past 20 years, the success rate of teams who opted for quarterbacks early in the first round hasn’t been much better than 50 percent. 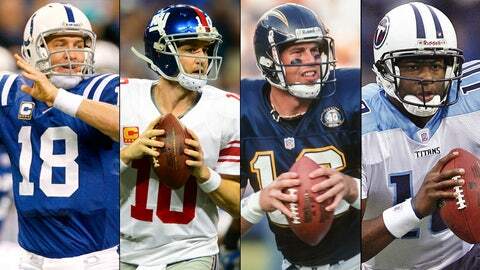 Only two that were picked in the top 10 — Peyton Manning and Eli Manning — have managed to win a Super Bowl. Meanwhile, Ben Roethlisberger (the 11th pick in 2004), Aaron Rodgers (the 24th pick in 2005) and Joe Flacco (the 18th pick in 2008) all have at least one Super Bowl ring.